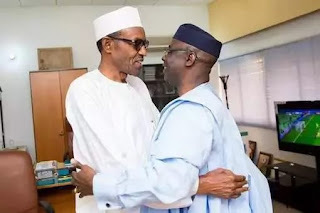 Popular pastor and overseer of the Latter Rain Assembly Tunde Bakare has revealed that President Muhammadu Buhari had always wanted a vice president that could hold the country together should he die in office. The Cable reports that Bakare made this revelation to his congregation about a month ago. According to him, Buhari, who rejected former President Olusegun Obasanjo’s choice of Ngozi Okonjo-Iweala, the former minister of finance as a deputy, believed that because of his age, he may die in office. Buhari reportedly gave the example of late President Umar Musa Yar’Adua as backing for his desire for a strong deputy. Bakare said he has documented all that happened between him and Buhari ahead of the presidential race together on the platform of the Congress for Progressive Change (CPC) in 2011 in his book: ‘Strategic Intervention in Governance’. “After I was called and I went to Abuja, and I sat with Mr President or General Buhari then, I said why me? ‘I’m not a politician’, ‘I do not belong to any political party’, ‘I am not carrying card of any party, why me’? “He gave me all the reasons, they are written in the book; Strategic Intervention in Governance. He gave three reasons, but the one that made everyone around me that day to dove their hats was when he said: I am not as young as you think, and even Yar’Adua that is younger is dead. “In case I die, I know you can hold the nation together. That was when Jim (he didn’t give his surrname) removed his cap and said egbon, you must agree,” The Cable quoted Bakare as saying. Meanwhile, acting President Yemi Osinbajo has warned Christian leaders in the country to preach the love of Jesus Christ rather than hate messages. Osinbajo gave the warning on Tuesday, February, 7, when declaring open the 14th National Biennial Conference of the Pentecostal Fellowship of Nigeria, The Nation reports.